During our travels we often get souvenirs for others. But what about those of us that are always doing the traveling? What kind of souvenirs do travelers receive as gifts? We asked some of our fellow travel bloggers to share with us what their favorite souvenirs have been and why. My favorite souvenir that someone gave me was a tin from Harrod’s in London filled with tea cookies. It was from my then unmarried son who remembered that I loved London, Harrods, and tea time. Isn’t that sweet? He himself always has loved tea time since we took him as a child to afternoon tea at The Fairmont Empress Hotel in Victoria, Canada, where he was amazed by all the cakes and cookies served to him before dinner! Not technically a souvenir as I was in the country of residence when I received it but, the most thoughtful souvenir I was given was a bag full of Canadian memorabilia from my good friend from home, Gemma T’s, family who had immigrated there when they were younger! While living in Vancouver, I met the now adult triplets and older brother for dinner, not only did they pay for my meal but also presented me with bag a full of maple leaf items including a flag, glasses, and lanyard. Craig now uses the flag to cover up the mess under his decks and I wear my lanyard every day to work! (Scottish) Canadians really are the friendliest people on Earth! Find out what else I go up got up to here at my Vancouver trips guide! We are gay couple, Stefan and Sebastien, currently on a big trip across Latin America. We started in Argentina and loved discovering the gaucho culture in the countryside. Gauchos are like the cowboys of the country who used to rear and farm the large numbers of cows here in the various estancias (like ranches). At one estancia we visited, we got the chance to dress up like gauchos, do some horse riding and of course eat plenty of delicious BBQ meat washed down with Malbec red wine. Our ponchos were our souvenirs to each other from this wonderful day, which we wear to keep us warm. They are decorated with the Inca cross and although aren’t the most practical for the travels (they are dry clean only), they are the best souvenir we’ve been given to date in our travels in Latin America. The best souvenir that I’ve received was from my now partner around the time that we just started dating. He had spent a summer in Italy and brought me back a GIANT bar of Gianduja chocolate from Turin, Italy. Gianduja chocolate is an early form of a chocolate bar that is a mixture of chocolate and hazelnuts that was invented in Turin. I have a huge sweet tooth, so it was the perfect gift although it required dry ice to ensure that the chocolate didn’t melt on its way back to the United States. A colorful hand-made tote and a tiny doll with two plaits and a statement smile inside the bag. A bottle of mezcal Amores half empty already next to another one of mezcal Siete Misterios waiting for its turn. Two shot-sized terracotta glasses, a shiny black fedora and a handful of recipes I would like to carry out in the kitchen once I manage to find the right ingredients. I got off the souvenirs wagon a long time ago. So long that I can’t recall any trip at this point where so many memories succeeded in making it back home with me. And this could only mean one thing. I was back from a heart warming place, the one that would make me break that rule of not increasing my luggage’s size with clutter. Let’s just say I was back from Mexico city, a place I fell for after experiencing its goodness last May! My favourite souvenir of all times is… a Tito’s head-shaped piggy bank. A flashy pink one. This past summer my boyfriend and I went on a Balkans road trip. He’s a little obsessed with the history of the Balkans and he likes to find the tackiest souvenirs he can. We were in Belgrade, visiting Tito’s memorial, when he saw this souvenir at the museum’s shop and he decided straight away he wanted to buy it for me – well, for us! We had just literally moved together a couple of weeks before the trip, so this souvenir for me has a special meaning because it’s the first decoration for our new home. Now we have a shelf that will be filled with the tackiest souvenirs we can find around the world! I met Jake and his brother six years in Argentina during a last minute trip to see the Iguazu waterfalls. We became instant friends! And even though we’ve both moved around the country throughout the years, we’ve stayed and touch and even live near each other again. I was so pleasantly surprised when Jake and I met up for dinner and he handed me a small cooler. Inside was a tube that looked like toothpaste. Umm… thanks? But no, it was caviar!! Turns out, Jake had just spent some time in Norway and brought some back for me. We tend to think of caviar as something reserved for high-end or extravagant events, but in Norway it’s sold at the grocery store along with other every day items. It was awesome to learn more about a country through such a thoughtful (and yummy) gift! Caviar in a tube – whatever next?! Thanks for featuring us Vicky! Fun souvenirs. Someone went a little Canada crazy. Hmmmm, I need to think about what I received from others. Probably a quirky tshirt. Interesting concept for a post. Souvenirs are great as they encapsulate the memories of your travel experiences. Buying souvenirs is one thing, but if the souvenir is a gift from someone, it adds a special meaning to it. We completely agree with you Vyjay! This is unique! It’s always good to see what types of souvenirs people get, I want that chocolate though! Cool souvenir items! I actually bought myself a London tin with those biscuits in it. 😉 My best souvenir I’ve ever gotten was a Russian stacking doll. I still have her after about 20 years. I must say my favorite is Stefania’s Tito’s head-shaped piggy bank. Its just too cute. Pretty yet practical..and that’s a winning combo. I always try to get such souvenirs for myself. Oh wow look at these quirky things – that huge chocolate bar, wonderful tote and wait what – a toothpaste lookalike caviar? no way! haha. Great stuff. Caviar in a tube?!?! I’ve got to get me some of that! My favorite souvenir is a pencil drawing of the Eiffel Tower from our first visit to Paris. It was an original and we framed it with pride and hung it in our living room. We continued to consider it an original until resisting Paris a couple of years later and finding similar prints in virtually souvenir shop in Paris. Oh well, we bought two more “originals”, framed them, and they are displayed as a set in our living room! My favorite was the chocolate bar! When you find a good chocolate nothing can beat it! My favorite souvenir is a tshirt or something else that I can wear that always reminds me of my time at that location. Yeah! What about us huh? We need gifts as well people. Anyway, I think it was a pen from a friend who had visited Miami. It was really beautiful. Encased in a wood finish with Miami engraved on one side and my name on the other. It’s not a cheap pen either. I love it so much that I keep refilling it and using it over and over. Still in use up to this day. What a thoughtful gift! It must be beautiful! I stopped buying souvenirs a long time ago, unless it’s a piece of jewelry or something I can eat or drink. I have 3,000 square feet worth of furniture and stuff from my travels in storage that I’ve not seen for three years. I don’t really need more stuff, so memories are normally what I take with me. Excellent post and a tough question! I have a few favourites – a tiny jewel box from Thailand, a bead bracelet from Barcelona, and hiking belt from Switzerland. Those are great souvenirs Nancy! I tend to get myself jewelry when I travel because it’s usually pretty small and easy to pack. Love this post – very creative! I’m a big fan of Harrods so I’d be happy with any gift from there 🙂 Thanks for sharing! Oh, I know! Such a great store! 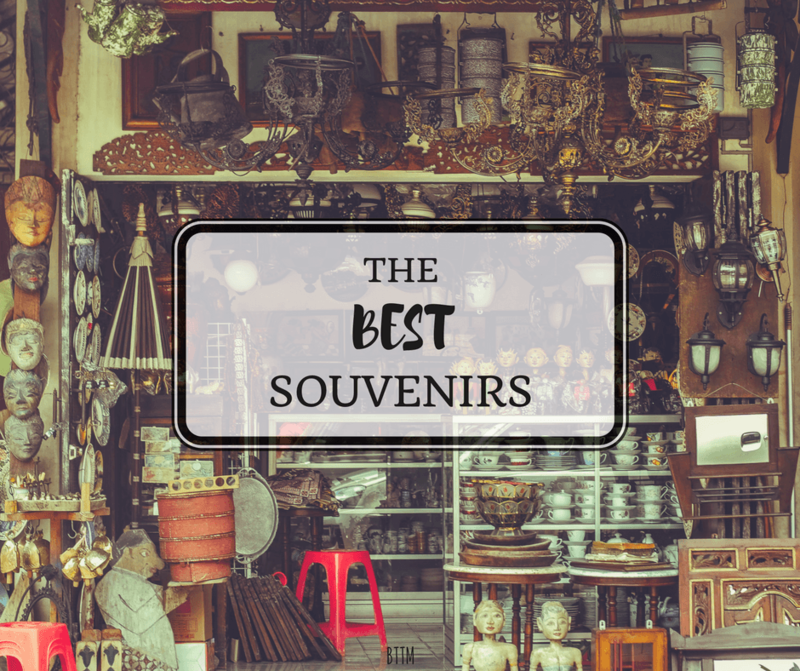 This is a great souvenir list! I was once given a pair of marracas in Mexico which were pretty cool!